I have no idea what his fascination is with the toilet, but our toddler Izaiah is in L-O-V-E and I am D-I-S-G-U-S-T-E-D! Why? No matter what we do, he still finds his way to play in it . Yes, my oldest son’s iPod was recently thrown in the toilet by my toddler. Thankfully, we had a super duper iPod case on it. With some quick thinking from my husband, he immediately turned the iPod off, stripped it of it’s case and set it to dry so it still works…. fortunately. Yes, Izaiah has taken the plunger on numerous occasions, swirled it around the toilet then drug nasty toilet water through out. Just lovely, ain’t it! Disgusting as it is, Izaiah recently washed his hair with a cup leaning over the toilet bowl with toilet water. I gagged and am gagging typing this. Recently my husband bought me personalized coffee mugs as a sweet gift. Izaiah thought it would be sweet to use them to drink from. Yes, you guessed it. He used my mugs as well cups to drink from the toilet – easy access just like a water fountain but at his height. While it’s great and all that our toddler appreciates a clean toilet, him cleaning it just isn’t what we need. Nor does the bathroom floor appreciate it. It’s time to buy a toilet lock. This Safety 1st prograde toilet lock has a good set of reviews on Amazon. Has anyone used? 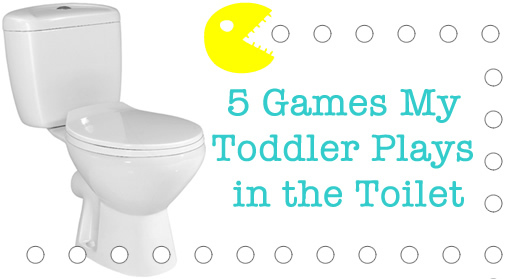 Does Your Toddler Have a Fascination with the Toilet?